Synthetic peptide near the N terminus of the full-length mouse KISS1 protein. Jurkat whole cell lysate (ab7899). Our Abpromise guarantee covers the use of ab19028 in the following tested applications. WB Use a concentration of 1 - 2 µg/ml. 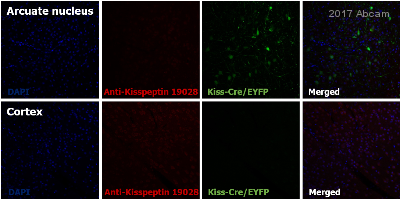 Predicted molecular weight: 15 kDa.Can be blocked with Kisspeptin peptide (ab37702). Metastasis suppressor protein in malignant melanomas and in some breast cancers. May regulate events downstream of cell-matrix adhesion, perhaps involving cytoskeletal reorganization. Generates a C-terminally amidated peptide, metastin which functions as the endogenous ligand of the G-protein coupled receptor GPR54. Activation of the receptor inhibits cell proliferation and cell migration, key characteristics of tumor metastasis. Kp-10 is a decapeptide derived from the primary translation product, isolated in conditioned medium of first trimester trophoblast. Kp-10, but not other kisspeptins, increased intracellular Ca(2+) levels in isolated first trimester trophoblasts. Kp-10 is a paracrine/endocrine regulator in fine-tuning trophoblast invasion generated by the trophoblast itself. The receptor is also essential for normal gonadotropin-released hormone physiology and for puberty. The hypothalamic KiSS1/GPR54 system is a pivotal factor in central regulation of the gonadotropic axis at puberty and in adulthood. Very high expression in placenta, with the next highest level in testis and moderate levels in pancreas, liver, small intestine and brain at much lower levels. Expression levels increased in both early placentas and molar pregnancies and are reduced in choriocarcinoma cells. Expressed at higher levels in first trimester trophoblasts than at term of gestation, but only expressed in the villous trophoblast. Belongs to the KISS1 family. Processed by MMP2 and MMP9. ab19028 staining human breast cancer cells. 20 µg of protein were loaded in to each lane. 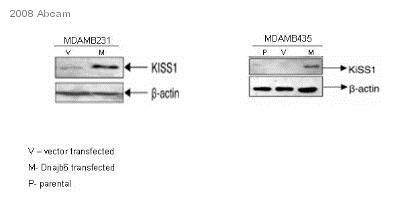 The primary antibody was diluted to 1 µg/ml and incubated with the blot for 15 hours at 4°C. 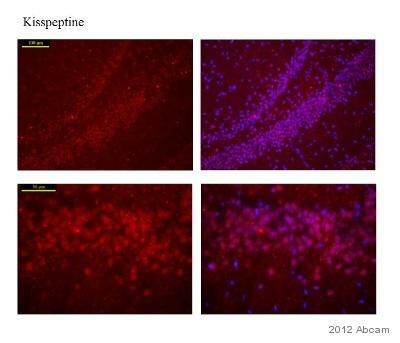 A HRP conjugated donkey anti-rabbit IgG antibody, diluted 1/5000, was used as the secondary. Publishing research using ab19028? Please let us know so that we can cite the reference in this datasheet. Does this antibody recognize the secreted form of the protein? Thank you for your enquiry. I have been informed by our source for this antibody that the proprietary peptide used to generate this antibody is from the N-terminus of the secreted protein, so it will recognize the secreted as well as the intracellular precursor form. If you have any other questions, please do not hesitate to contact us. A simple way to get the answer is to know the peptide sequence used as immunogen for production of the Ab (ab19028). OR tell me where "the peptide containning amino acid 14-27" resides in the 130 amino acid kisspeptin ?